The Broadway and West End smash hit musical returns to the UK with a brand new production, coming to Glasgow’s King’s Theatre next October! The habits have hit the road again! The Broadway and West End smash hit musical comedy Sister Act returns to the UK with a brand new production directed and choreographed by Craig Revel Horwood. And it’s coming to Glasgow’s King’s Theatre in from the 4th until the 16th of October 2016! 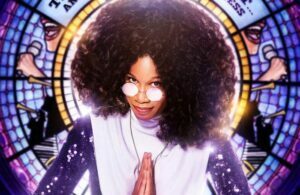 Sister Act tells the hilarious story of Deloris Van Cartier, a disco diva whose life takes a surprising turn when she witnesses a murder. Under protective custody she is hidden in the one place she won’t be found – a Convent! Disguised as a nun and under the suspicious watch of the strict Mother Superior, Deloris helps her fellow sisters find their voices as she unexpectedly rediscovers her own. Transforming the choir into the most glorious musical act in town, Deloris forms a lasting bond with her newfound friends – and the gang that’s chasing her finds itself up against an unstoppable team of soulful sisters! A sparkling tribute to the universal power of friendship, sisterhood and music. Featuring original music by Tony® and 8-time Oscar® winner Alan Menken (Disney’s Aladdin, Beauty and the Beast, Newsies, and Enchanted), dazzling dance routines and songs inspired by Motown, soul and disco, Sister Act is the funniest and funkiest musical around. This feel-amazing musical comedy smash that the New York Post called ‘Ridiculously fun’ and has had audiences jumping to their feet in total agreement! Now that it’s coming to Glasgow you too can see why musical audiences fell in love with the funniest and funkiest nun on the run, and her heavenly sequinned sisters! Make sure you get your tickets soon!